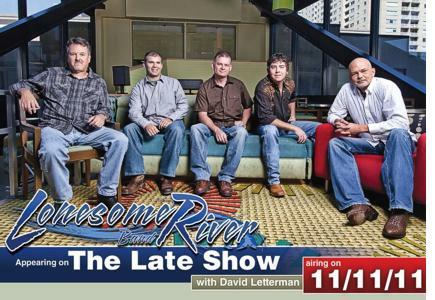 The Lonesome River Band will perform with Steve Martin next week, November 11, 2011 on The Late Show with David Letterman. The performance is in celebration of Sammy Shelor's Steve Martin Prize for Excellence in Banjo and Bluegrass award as recently announced. The Steve Martin Prize is chosen by a who's who list of talents including Steve Martin, Earl Scruggs, Pete Wernick, Tony Trishchka, Bela Fleck and more. Sammy Shelor, band leader and banjo player with the hit group Lonesome River Band was recently awarded the second Steve Martin Prize for Excellence in Banjo and Bluegrass honor. Sammy and the Lonesome River Band will perform with Steve Martin on the "Late Show With David Letterman" Friday, November 11, 2011. Rural Rhythm Records congratulates Sammy Shelor, band leader and banjo player with the hit group Lonesome River Band. As reported in today's New York Times, Steve Martin announced Sammy Shelor is the second winner of The Steve Martin Prize for Excellence in Banjo and Bluegrass. Sammy and the Lonesome River Band will perform with Steve Martin on the "Late Show With David Letterman" Nov. 3, 2011.